The small green (or red) leaf may not be noticeable in the herb section at the supermarket, but once you’ve had a taste of it, you won’t be able to forget its distinct and fresh flavour. As a garnish or as a main ingredient, shiso can be used in a various of ways…even in desserts! One thing is for sure, it’s very easy to get hooked on shiso. Shiso is an ancient herb in Japan. People only consume its leaves. There are 2 kinds of shiso – one of them is called aojiso (green shiso; “ao” means green in Japanese). Aojiso is used as a side for sushi or sashimi, to add a touch of colour. 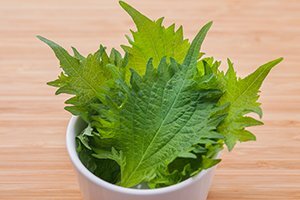 The tasty leaf is also used as an ingredient in tempura, where it’s coated in a batter then fried – a great way to enjoy the aroma and freshness of the herb! The other type comes in red, called akajiso (red shiso; “aka” means red in Japanese). Akajiso is mainly used as food colouring.The vivid herb is commonly used to dye umeboshi (traditional Japanese plum pickles) into a beautiful red hue. 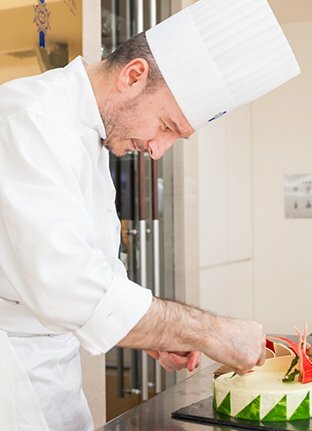 Chef Dominique presented a cake made using shiso and basil.He then suddenly had an idea: he made two chocolate decorations and placed them on the cake, turning it into an artistic and aesthetically stunning creation. “The bottom layer is an almond dacquoise. I placed basil streusel on it, then a layer of green shiso bavarois. I also put a ring of red shiso gelée in the centre of this green shiso bavarois. 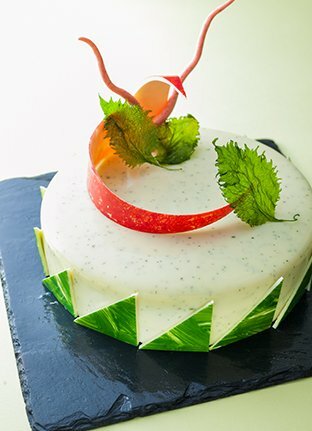 I then coated the whole cake with a glaçage made of a mix of white chocolate and green shiso – the green shiso waschopped finely and mixed into white chocolate. In fact, Chef Dominique is interested in ecology. Everybody at school knows that he does not like wasting paper towels and using disposal piping bags. He also likes making people happy and this spirit is reflected in his cake creations. When he bakes, he envisions the pleased expression on the face of the person who eats it.